District One: North of El Segundo Blvd. & West of Hawthorne Blvd. District Two: North of El Segundo Blvd. & East of Hawthorne Blvd. District Three: South of El Segundo Blvd. & East of Hawthorne Blvd. District Four: South of El Segundo Blvd. & West of Hawthorne Blvd. 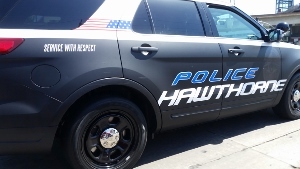 About: The Hawthorne Police Department was founded in 1922 in the heart of Los Angeles County. Hawthorne is the home of the Beach Boys, Northrop Corporation and more recently SpaceX and Tesla Motors Design. With nearly 100 sworn officers and 60 support staff serving this ever growing community of over 90,000 residents, the Department maintains its technical edge by being the only department in the South Bay with its own helicopter, electric motorcycles, Tactical Medicine Program, armored rescue vehicle and a state of the art police facility. Below is the Google Map to the Hawthorne Police Department.